Managed to get some seats on a busy Sunday afternoon of shopping. Beer pleasant enough but pricey and neither barman seemed to want to fill the pint to the correct mark. My wife said the Guinness was excellent as the temperature was almost what it should have been. Very ordinary, corner boozer. The pint of Youngs Gold I drank was OK but there are better pubs elsewhere in the area. I use this place a lot and I've never found it anything other than a good basic boozer with decent beer. Wedge shaped old style boozer on the Seven Dials just north of Covent Garden. The pub is effectively divided into two rooms although it is possible to walk right round the smallish central bar. The front room is mainly standing with a TV above the door for watching the football. the smaller back room has a couple of sofas (Boo Hiss!! ), a fireplace and a small number of tables. As an added Christmas attraction the fireplace had a pair of Santas legs hanging down to give the impression he was stuck in the chimney!!!. Christmas card hanging up in the bar gave a bit of a homely feel to the place as well. Ales on were Adnams and Pride (GKIPA was off). 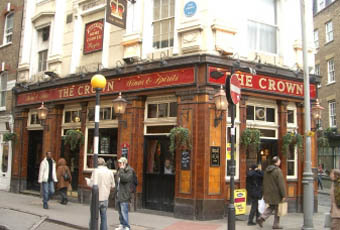 Overall the Crown is a pleasantly traditional place with that slightly scruffy feel that I rather like There are not many pubs left like this in the area and it's worth a visit if you are in the vicinity.